ICSC, Retail Forward, Retail Metrics and RetailSails have all crunched the numbers from the publicly-traded retailers that report same-stores sales and the figures show that the post-holiday shopping period went well for most firms. Retail Forward and RetailSails recorded the gain as 9.2 percent. ICSC said sales rose 9.0 percent. Retail Metrics said same-store sales rose 8.7 percent. The ISM Non-Manufacturing Index rose from 53.0 to 55.4 in March, and every component with the exception of supplier deliveries also rose. Neew orders in particular rose to 62.3, a very strong showing. The Employment component also rose to 49.8, meaning very slight contraction. The trend is very positive, however, as the percentage of firms planning to hire increases every month (16% in March) and the percentage planning to lay off workers decreases each month (19% in March). The wholesale inventory to sales ratio declined ever so slightly. This ratio is still at a very low, i.e., tight, level. The ICSC reported that seasonally adjusted weekly same store sales we up 4.7% YoY and up 2.1% from the previous week. Some of this was due to the change in the week of the easter holiday this year vs. last. ShopperTrak reported that sales "increased for the seventh consecutive week, rising a strong 15.6% compared to a year ago, while sales rose 15.1% on a week-over-week basis." The E.I.A. reported that gasoline cost $2.80 a gallon. Oil was near $85/barrel late in the week. Usage for last week slightly above last year, as was the 4 week average. In general, however, for the last month usage has been approximately equal to that of 2009. Oil moved above $85 a barrel for most of the week. While Oil futures remained in contango (prices rising as we go further out into the future, prices do not reach $90 until the December 2011 contract, and the 2018 contract sells for $95.08. This suggests to me that the futures market believes that higher prices now would not be sustainable. The BLS reported that new jobless claims were only 460,000, the highest number in six weeks. Despite some pessimism from the usual sources, the 4 week average only moved up to its second lowest reading in over 18 months. Railfax again showed another strong week in cyclical goods, although intramodal loads, typically imports, slowed, making for a sideways overall reading. The Daily Treasury Statement shows that for the first six reporting days of April, 2010 is running behind 2009, $45.9B vs. $47.5B. The 4 week moving average of tax receipts continues to show this year ahead of last year, $139.6B vs. $136.2B, or a difference of +2.5%. In short, the weekly numbers show the Recovery is continuing to advance, with Oil a significant problem going forward. It's that time of the week. Think about anything except the economy or the markets. We'll be back on Monday. Just a quick note. I am all jammed up in the real world, so I will post these over the weekend. 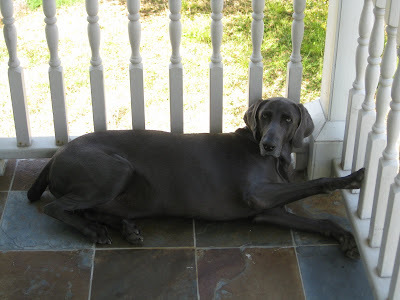 In the meantime, rumor has it this week we have doggies! The nation's retailers had a blowout month in March as shoppers went on a spending spree that increased sales by a record 9.1%, providing the best monthly showing in at least a decade and offering bold new evidence that a strong economic recovery could be ahead. More than a dozen major chains posted double-digit gains, including discounter Target Corp., department store Kohl's Corp., luxury chain Saks Inc., mid-priced seller Gap Inc. and teen retailer American Eagle Outfitters Inc. Results are based on sales at stores open at least a year, known as same-store sales, which are considered a reliable measure of a retailer's health. Of the 28 retailers whose results were tallied by Thomson Reuters, 92% beat sales expectations. The group's 9.1% sales gain was significantly better than the 6.3% increase analysts had been expecting and marked the best month on record since the company began tracking data in 2000. Although sales results were helped by an earlier Easter and comparisons with a weak March 2009, when sales declined 5%, analysts said the gains reflected real underlying strength. Pent-up demand, warmer weather and broader economic improvement helped drive spending, they said. "The fact that retailers vastly exceeded already raised expectations suggests to us that there is more going on here," said Ken Perkins, president of research firm Retail Metrics Inc. "The consumer is feeling better about their situation and is more willing to make discretionary purchases than at any time that we've seen in the last couple of years, since the onset of the recession." 3.) We've only had one month of good employment data, which is probably a big factor in low consumer expectations data. We need at least a few more months of good employment data to say we're seeing a trend of better news. And ever then, there is a tremendous amount of slack in the labor market which will keep wage growth depressed for some time. Available indicators suggested that the labor market might be stabilizing. Declines in private payrolls slowed markedly in recent months, and, in the absence of the snowstorms, private employment probably would have risen in February. The average workweek for production and nonsupervisory workers fell back in February after ticking up in January; however, the drop was likely due to the storms. The unemployment rate was unchanged at 9.7 percent in February, and the labor force participation rate inched up over the past two months. 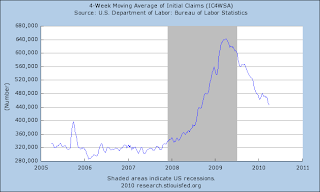 However, the level of initial claims for unemployment insurance benefits remained high. After increasing briskly in the second half of 2009, industrial production (IP) continued to expand, on net, in the early months of 2010, rising sharply in January and remaining little changed in February despite some adverse effects of the snowstorms. Recent production gains remained broadly based across industries, as firms continued to boost production to meet rising domestic and foreign demand and to slow the pace of inventory liquidation. Capacity utilization in manufacturing rose further, to a level noticeably above its trough in June, but remained well below its longer-run average. As a result, incentives for manufacturing firms to expand production capacity were weak. The available indicators of near-term manufacturing activity pointed to moderate gains in IP in coming months. 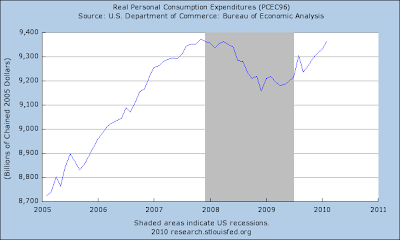 Consumer spending continued to move up. Although sales of new automobiles and light trucks softened slightly, on average, in January and February, real outlays for a wide variety of non-auto goods and food services increased appreciably, and real outlays for other services remained on a gradual uptrend. In contrast to the modest recovery in spending, measures of consumer sentiment remained relatively downbeat in February and had improved little, on balance, since a modest rebound last spring. Household income appeared less supportive of spending than at the January meeting, reflecting downward revisions to estimates by the Bureau of Economic Analysis of wages and salaries in the second half of 2009. The ratio of household net worth to income was little changed in the fourth quarter after two consecutive quarters of appreciable gains. Activity in the housing sector appeared to have flattened out in recent months. Sales of both new and existing homes had turned down, while starts of single-family homes were about unchanged despite the substantial reduction in inventories of unsold new homes. Some of the recent weakness in sales might have been due to transactions that had been pulled forward in anticipation of the originally scheduled expiration of the tax credit for first-time homebuyers in November 2009; nonetheless, the underlying pace of housing demand likely remained weak. The slowdown in sales notwithstanding, housing demand was being supported by low interest rates for conforming fixed-rate 30-year mortgages and reportedly by a perception that real estate values were near their trough. Real spending on equipment and software increased at a solid pace in the fourth quarter of 2009 and apparently rose further early in the first quarter of 2010. Business outlays for motor vehicles seemed to be holding up after a sharp increase in the fourth quarter, purchases of high-tech equipment appeared to be rising briskly, and incoming data pointed to some firming in outlays on other equipment. The recent gains in investment spending were consistent with improvements in many indicators of business demand. In contrast, conditions in the nonresidential construction sector generally remained poor. Real outlays on structures outside of the drilling and mining sector fell again in the fourth quarter, and nominal expenditures dropped further in January. The weakness was widespread across categories and likely reflected rising vacancy rates, falling property prices, and difficult financing conditions for new projects. However, real spending on drilling and mining structures increased strongly in response to the earlier rebound in oil and natural gas prices. The pace of inventory liquidation slowed considerably in late 2009. As measured in the national income and product accounts, real nonfarm inventories excluding motor vehicles were drawn down at a much slower pace in the fourth quarter than in each of the preceding two quarters. Available data for January indicated a further small liquidation of real stocks early this year in the manufacturing and wholesale trade sectors. The ratio of book-value inventories to sales (excluding motor vehicles and parts) edged down again in January and stood well below the recent peak recorded near the end of 2008. Inventories remained elevated for equipment, materials, and, to a lesser degree, construction supplies, while inventories of consumer goods and business supplies appeared to be low relative to demand. While there are concerns going forward (which always exist in any economy the size of the US') there is plenty of good news. And it's not just one sector. Manufacturing is coming around. 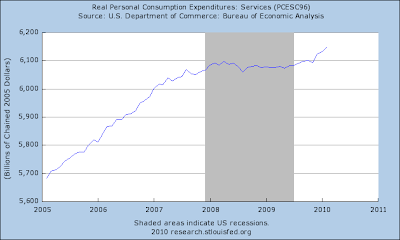 Consumer spending is picking up. Exports are growing. Businesses are picking up investment. Other countries are getting better. Most of these factors have been completely overlooked at the expense of over-publicizing the bad news. For example, the US manufacturing sector has staged a remarkable comeback over the last year. Yet there is no new of that. Personal PCEs have rebounded as well -- again, no news. The bottom line is there are some damn good economic numbers out there right now, yet no one wants to acknowledge them. The real story of yesterday's market was the rally (a) that started at 10:30 and continued until 12:30. Notice the consolidation that occurred along the way (b). After the rally was over, prices consolidated using (c) as support. On the daily chart, notice that prices broke the uptrend and that the MACD has given a sell-signal. However, the A/D line is still strong. The American economy appears to be in a cyclical recovery that is gaining strength. 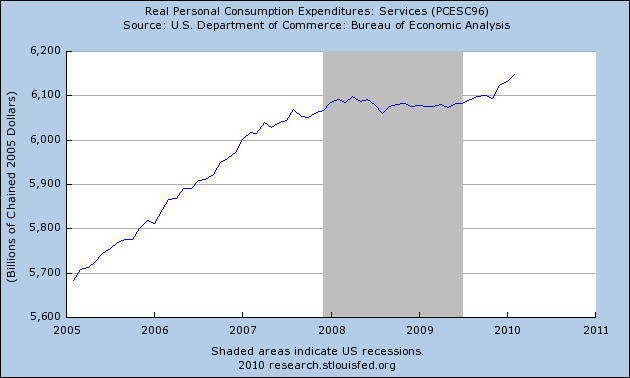 Firms have begun to hire and consumer spending seems to be accelerating. “The tough measures that we took — measures that were necessary even though sometimes they were unpopular — have broken this slide and are helping us to climb out of this recession,” he said in a speech at a factory making battery components in North Carolina. Note, however, that he seemed to believe the country remained in recession. It is virtually certain that is not accurate, as least as will be determined by the arbiters of recession at the National Bureau of Economic Research. “The recession is over,” one of those arbiters, Jeffrey Frankel of Harvard, wrote this week. But the White House is unwilling to make that claim. Why is good news being received with such doubt? Why is “new normal” the currently popular economic phrase, signifying that growth will be subpar for an extended period, and that the old normal is no longer something to be expected? It is possible, of course, that I am wrong and the prevalent pessimism is correct. Many economic indicators, including Thursday’s retail sales report, are looking up, but that does not prove the recovery will be self-sustaining. There are issues relating to over-indebted consumers and local governments. The housing collapse will have an impact for some time. But there are, I think, a number of reasons for the glum outlook that are unrelated to the actual economic data. First, the last two recoveries, after the downturns of 1990-91 and 2001, were in fact very slow to pick up any momentum. It is easy to forget that those recessions were also remarkably shallow. If you are under 45, you probably don’t have much recollection of the last strong recovery, after the recession that ended in late 1982. Add to that the fact that the vast majority of the seers did not see this recession coming. Remember Ben Bernanke assuring us the subprime problem was “contained”? In mid-2008, after the recession had been under way for six months, the Fed thought there would be no recession, and the most pessimistic member of its Open Market Committee thought the unemployment rate could climb to 6.1 percent by late 2009. It actually went over 10 percent. In January of this year — after the recession had probably been over for at least a few months — the most optimistic member of the committee expected the unemployment rate to fall to 8.6 percent by late this year. The consensus was for a rate no lower than 9.5 percent. Having been embarrassed by missing impending disaster, there is an understandable hesitation to appear foolishly optimistic again. But if that is normal, one factor that brings optimism to some forecasts is absent this time. Both Republicans and Democrats have good reasons to be negative. Republicans are loath to give President Obama credit for anything, and no doubt grate when he points to his administration’s stimulus program as a cause of the good economic news, as he did in North Carolina. Notice that over the last three days, the dollar has been trading in a fairly tight trading range. The overall uptrend (a) is still intact. Additionally, the moving averages are still in a very bullish orientation. However momentum (c) is weak and the A/D line (d) is as well. Fundamentally, the dollar has risen not because it's strong but because the euro is weak. Traders are concerned that Greece will default on their plans within a year. As a result, they have been selling the euro and buying the dollar. The Labor Department is citing special calendar factors for an unexpected jump in initial jobless claims to 460,000 in the April 3 week vs. the prior week's 442,000 (revised 3,000 higher). The Labor Department is not only citing Easter as a distortion but also the Cesar Chavez holiday in California, and it is further warning that seasonal volatility will shake up the numbers through the next several weeks. Otherwise, according to Market News International, the department reports "nothing unusual." Special factors give special importance to the four-week average which is at 450,250, up 2,250 from the end of March but down more than 20,000 from the beginning of March. How this month-to-month comparison tracks in the weeks ahead will shape expectations for the April employment report. The initial leg down (a) is a solid move. But we're still in a 450-490 range since the beginning of the year which I don't like. U.S. retailers on Thursday reported strong sales gains for March, adding to evidence that consumers are feeling more confident as the economy stabilizes. Sales at stores open at least a year rose 9.1% last month, according to Thomson Reuters, the best monthly showing since the firm began tracking the figures a decade ago. From discounters to luxury apparel stores, retailers surpassed bullish analyst expectations and pointed to broad demand for merchandise that didn't carry the kinds of markdowns that were so common just months ago. Retailers benefited not only from improved consumer confidence but also from easy year-ago comparisons, warmer weather and increased Easter shopping. Indeed, an earlier Easter this year could lead to less-robust April results, and the verdict is still out on an economic recovery. Read this in conjunction with yesterday's article from the NY Times. Prices are in a general up/down/up equal measurement rally. In this scenario, traders look for a move up which is measured in points followed by a correction. When prices move higher again, the assumption is prices will make a measured move (a move of the same amount of points) higher. 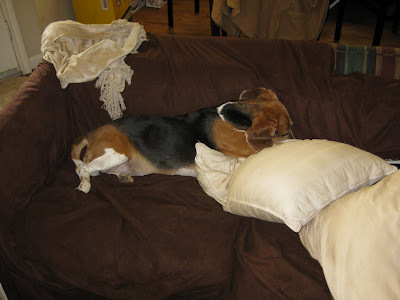 In this situation we have a leg up (a) which also has a three fan patter. 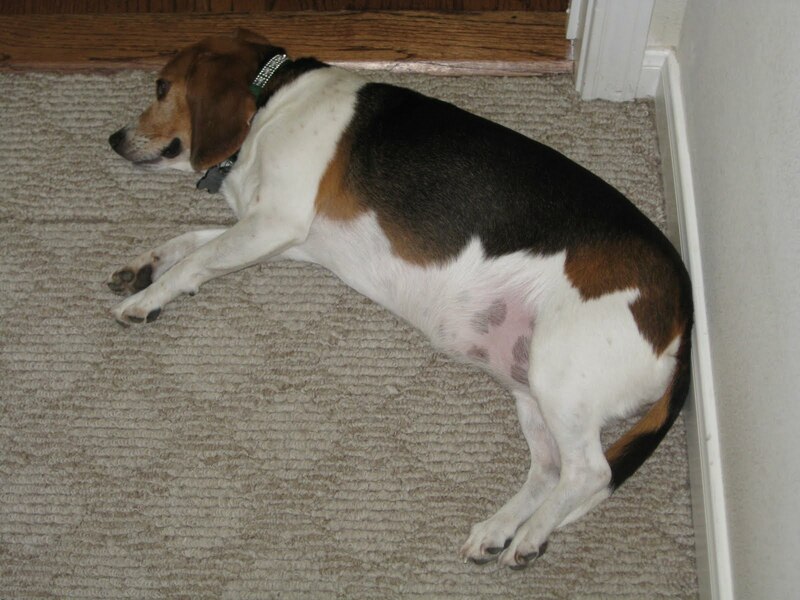 This is followed by a rounding top which moves into another rally. The consumer discretionary sector is in a clear upward trend as well. Notice we have a general uptrend (a), an upward sloping channel (b) and a third upward sloping trend line (c). Will China Let the Yuan Rise? The Chinese government is set to announce a revision of its currency policy in the coming days that will allow greater variation in the value of its currency combined with a small but immediate jump in its value against the dollar, people with knowledge of the consensus emerging in Beijing said Thursday. While there remains a possibility of a last-minute glitch that could delay the announcement, China’s central bank appears to have prevailed with its arguments within the Chinese leadership for a stronger but more flexible currency, these people said. They insisted on anonymity because of the sensitivity of the issue in Beijing. The model for the upcoming shift in currency policy is China’s move in 2005, when the leadership allowed the renminbi to jump 2 percent overnight against the dollar and then trade in a wider daily range, but with a trend toward further strengthening against the dollar. For the upcoming announcement, however, China is likely to emphasize that the value of the renminbi can fall as well as rise on any given day, so as to discourage a flood of speculative investment into China betting on rapid further appreciation, they said. The emerging consensus within the Chinese leadership comes as Treasury Secretary Timothy F. Geithner held meetings on Thursday with senior Hong Kong officials and prepared to fly on Thursday evening to Beijing for a meeting with Vice Premier Wang Qishan. This would be a very encouraging and important development, if true. In real life, I'm a tax lawyer. In that vein, IBLS has just published a book I wrote, titled A Practitioner's Guide to US Captive Insurance Law. The book is available from IBLS.com in their April 2010 tax law review. I also have a website for this area of my law practice. One of my main concerns over the last few weeks has been the possibility of the markets topping out. Take a look at the charts below -- you will notice that all are showing signs of important trend breaks. The SPYs have already broken their trend line. The IWCs have broken their trend line once, move higher and are now above that trend line again. With the equity markets, it's incredibly important to remember there are several important averages. If one breaks a trend, it's important but if the trend break isn't confirmed by other averages, then it's not that big a deal. The reason is money flows between the markets on a regular basis. For example there is a fair amount of intra-equity market movement from say small caps to big caps and between sectors such as health care and technology. These intra-market movements can effect one average disproportionately. But when you see all the averages make moves, it's time take notice. b.) Notice that support became resistance during yesterday's trading. During the rally, there were four gaps higher, at points a, b, c, and d. That tells us a supply/demand imbalance existed overnight. In addition, notice that on two days the overnight move -- along with a quick, post-opening move higher -- were all that happened during the trading day. a.) Since February, prices have been in a sharp rally. The degree of the rally is one that can't be maintained -- it's simply too sharp a move higher to have any staying power. b.) Prices are again at important points of resistance. The $21 bln reopened 10-yrs draw 3.9% with a record 3.72 cover and 43.1% indirect bidders. The market was rallying on the way into results with the market running to tag the 3.92% level. The yield was well under what was anticipated, meaning players were coming in more aggressively, willing to pay up whether they came in through the dealers or not, the direct bidders got a hefty 16.3%. The 10-yr has since swung to tip the 3.888% yield point. There is understandably a great deal of fretting and nervousness regarding the US' overall debt situation. With a looming supply that is quite large there are a number of people who are arguing that interest rates are heading higher. In fact, it seems that the argument is not a matter of if but when. However, notice that a4% yield is actually a pretty good yield in the current environment. The German 10 year is trading at 3.12%, the British 4 year is at 4.06, and the Australian 10-year is at 5.85%. So, 4% is actually a fairly attractive yield. 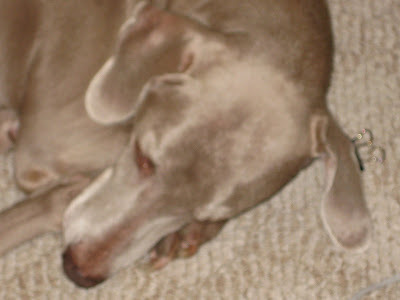 In addition, the market took a major nosedive today, adding to the attractiveness of Treasuries. Real (inflation-adjusted) PCEs have been increasing since the end of 1Q09. The largest area of PCEs -- services (which account for over 60% of PCEs) never dropped. 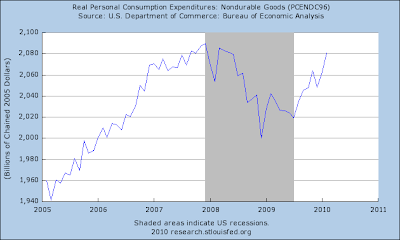 Instead, the spending on these goods leveled off. 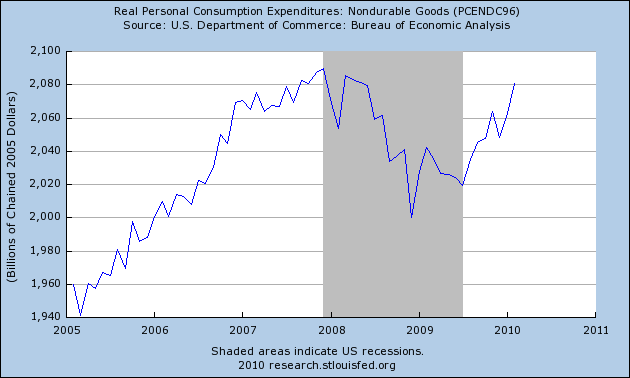 Spending on non-duarbale goods has been increasing since about the middle of last year. 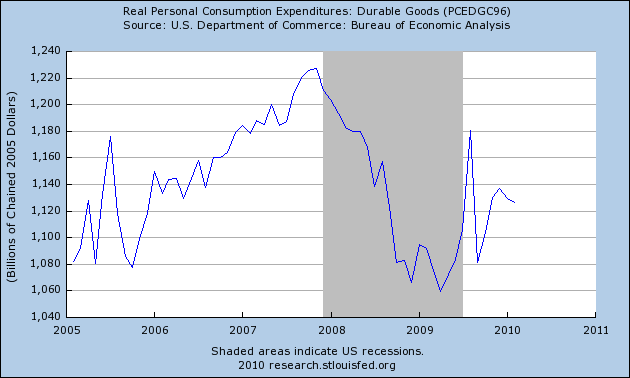 Durable goods are the main area where consumers have pulled back on their spending. a.) Resistance from Monday remained a factor for most of yesterday's action. Prices advanced several times beyond the line but could not maintain the momentum until after the release of the Fed's FOMC Minutes. b.) Prices started out in a general uptrend, hit resistance from the previous day (a) and moved lower in a downward sloping channel (c). d.) Prices started a sharp rally after the release of the Fed Minutes. Prices moved through resistance (e) and, after peaking, moved into a downward sloping channel (f) for the rest of trading. Since the beginning of 2009 copper has been in a rally (A). A.) Copper starter a sharp rally at the beginning of February. Sharp rallies typically don't last because prices cannot maintain a an upward trajectory like this over time. Along the way we've seen consolidation in two areas: B and C.
The main issue with this chart is the sharpness of the rally that started in February; rallies of that magnitude can't last. 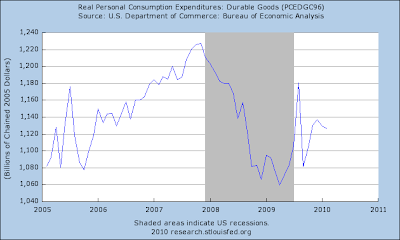 Is Deflation Off the Table? Federal Reserve Chairman Ben S. Bernanke and European Central Bank President Jean-Claude Trichet can’t afford to let the economic recovery distract them from the danger of falling into a deflationary morass akin to Japan’s. Core consumer prices, which strip out volatile food and energy costs, rose a record-low 1.5 percent in February from a year earlier in the 30 countries that form the Organization for Economic Cooperation and Development. Goldman Sachs Group Inc. economists see core inflation falling further later this year to about 0.3 percent in the U.S. and 0.2 percent in the euro area. The disinflationary trend is driven by the slack built up during the global economic slump. The 1.9 percent growth in OECD economies that the Paris-based organization forecasts for 2010 still will leave their total output for the year 4.1 percent below potential. With that much excess capacity, companies will remain under pressure to cut prices to keep customers and reduce costs to bolster profit. Policy makers have “gotten their eye off the immediate ball, which is deflation risk,” said Joseph Gagnon, a former Fed official who is now a senior fellow at the Peterson Institute for International Economics in Washington. “It’s misguided for anybody to be talking about exiting” from stimulus during the next year. Investors can profit from slowing inflation by selling Treasury Inflation-Protected Securities, Michael Vaknin, global fixed-income strategist for Goldman Sachs in London, said in a March 29 note to clients. The gap between yields on Treasuries and so-called TIPS due in two years, a measure of the outlook for consumer prices, stood at 1.56 percent on April 5, down from 2.92 percent on June 16, 2008. This is not an issue I'm worried about, but maybe the Fed should be? Will Energy Prices Derail the Expansion? More signs the economic recovery is taking hold sent oil prices to an 18-month high Monday but also stoked concerns that rising energy costs could put the brakes on the rebound just as it's getting started. The jump in crude prices was attributed to encouraging reports on job growth Friday and on manufacturing and services activity Monday, when traders had a first chance to pounce on the news after markets were closed for the Good Friday holiday. But some analysts warned that investors, in their haste to bet on the recovery, could push oil prices so high that consumers pull back on energy use and perhaps on other spending to compensate for energy's harder hit to their budgets. “People really believe that when the U.S. recovers, U.S. oil demand is going to blow through the roof. And, quite frankly, at $85 a barrel, that's nonsense,” said Ken Medlock, an energy studies fellow at Rice University's Baker Institute. On Monday, crude rose $1.75 to settle at $86.62 a barrel on the New York Mercantile Exchange, after making sizable gains last week as well. The price marked the highest close for crude since $88.95 a barrel on Oct. 8, 2008. U.S. gasoline demand dropped sharply following a spike in pump prices to $4.11 a gallon in July 2008 and remained sluggish in 2009 amid the recession. With the recovery still so fragile, the worry is that $3 gasoline right now could keep the economy in neutral. First, note the economic numbers have bee getting better and better. That means higher oil prices could be a problem once they get to a certain, undefined level. Last week I was filling up my tank and noticed that prices were $2.99/gallon. I was a bit surprised. But, given where oil's price currently is, it's to be expected. If there is one thing that could really kill the expansion quickly, it's oil prices. Bottom line: it looks like March Leading Economic Indicators will net about +0.8, the eleventh positive reading in a row. This is a welcome increase after February's just-barely-positive number. Remember the timing: positive LEI leads to positive GDP leads to job growth. Now that we have turned the corner on all three, the continuing positive LEI should mean continued positive GDP and jobs. Economic growth will almost certainly extend through the second quarter, but be more tepid than the 9 months from July 2009 through March 2010. Job growth should also continue, although a negative outlier (ex-census hiring) in this noisy series can't be ruled out. On the other hand, the storm cloud I saw in the distant horizon for the second half of this year is getting closer and looking more ominous. More on that (hopefully) later this week. A.) Prices have finally broken through the neck line of the head and shoulders pattern. A.) A little more than a week ago, prices gapped lower and printed a vbery strong downward moving bar. B.) Prices consolidated right around the neckline. C.) Prices gapped lower, again printing a strong bar. D.) The EMA picture is turning bearish -- all the EMAs are moving lower, prices are below the EMAs and the shorter EMAs are below the longer EMAs. A.) Prices opened up And then moved higher on some very strong bars. C.) Prices than moved higher on a volume surge (D). The report was issued today by Anthony Nieves, C.P.M., CFPM, chair of the Institute for Supply Management™ Non-Manufacturing Business Survey Committee; and senior vice president – supply management for Hilton Worldwide. "The NMI (Non-Manufacturing Index) registered 55.4 percent in March, 2.4 percentage points higher than the seasonally adjusted 53 percent registered in February, and indicating growth in the non-manufacturing sector. The Non-Manufacturing Business Activity Index increased 5.2 percentage points to 60 percent, reflecting growth for the fourth consecutive month. The New Orders Index increased 7.3 percentage points to 62.3 percent, and the Employment Index increased 1.2 percentage points to 49.8 percent. The Prices Index increased 2.5 percentage points to 62.9 percent in March, indicating an increase in prices paid from February. According to the NMI, 14 non-manufacturing industries reported growth in March. Respondents' comments are mostly positive about business conditions and the direction of the economy." In March, the NMI registered 55.4 percent, indicating growth in the non-manufacturing sector for the third consecutive month. A reading above 50 percent indicates the non-manufacturing sector economy is generally expanding; below 50 percent indicates the non-manufacturing sector is generally contracting. Note -- this is the third consecutive month of growth. ISM's Non-Manufacturing Business Activity Index in March registered 60 percent, an increase of 5.2 percentage points when compared to the seasonally adjusted 54.8 percent registered in February. Thirteen industries reported increased business activity, and three industries reported decreased activity for the month of March. Two industries reported no change from February. Comments from respondents include: "Seeing an increase in business. Our customers are feeling more optimistic"; and "New year budgets, as well as replacing inventories depleted during 2009." Note the balance between increasing and decreasing industries -- 13 to 3 with an additional two showing no growth. ISM's Non-Manufacturing New Orders Index grew in March for the seventh consecutive month. The index registered 62.3 percent, which is an increase of 7.3 percentage points from the seasonally adjusted 55 percent reported in February. Comments from respondents include: "Improving sales trend; capital money flowing with the start of a new year"; "More bids; work starting"; and "Prime selling month." Note -- that is seven consecutive months of growth in new orders. Employment activity in the non-manufacturing sector contracted in March for the 27th consecutive month. ISM's Non-Manufacturing Employment Index for March registered 49.8 percent. This reflects an increase of 1.2 percentage points when compared to the seasonally adjusted 48.6 percent registered in February. Six industries reported increased employment, eight industries reported decreased employment, and four industries reported unchanged employment compared to February. Comments from respondents include: "We are staffing to volume" and "Jobs are not being filled pending budget issues." This is the one drawback to the report -- employment is still "contracting". 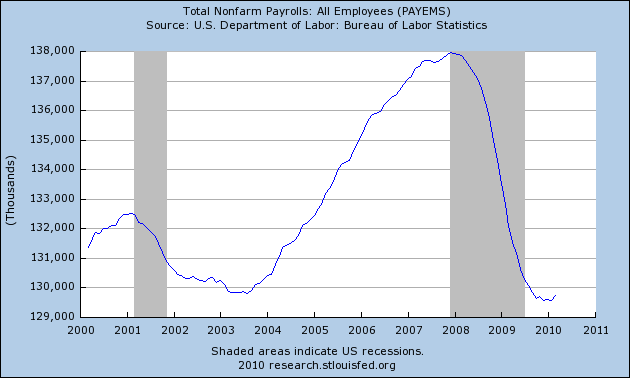 From a numbers perspective, this is in line with the ADP employment report but not the BLS report. This is a very good number aboud should provide some encouragement to the market. This article appeared on fivethirtyeight.com on Sunday. On Friday, the BLS reported the latest job figures. As I will explain, this was a good report overall. Both the household and establishment survey printed some good, solid numbers. Put another way, it's pretty obvious the recession is over. Nonfarm payroll employment increased by 162,000 in March, and the unemployment rate held at 9.7 percent, the U.S. Bureau of Labor Statistics reported today. Temporary help services and health care continued to add jobs over the month. Employment in federal government also rose, reflecting the hiring of temporary workers for Census 2010. Employment continued to decline in financial activities and in information. Remember there are two surveys -- the household and the establishment. The household provides information for the unemployment rate. So, let's start there. 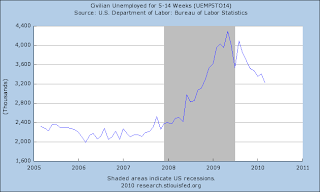 It appears the unemployment rate has topped out in the 9.5%-10% range. While we're not seeing any downward momentum, we aren't seeing anymore strong upside moves either. Bachelor's or higher: 4.9% (this is near full employment from an economic perspective). The civilian labor force increased by 398,000. This led to an increase in the participation rate (the percentage of the population that is part of the labor force) of .1%, from 64.8 to 64.9. 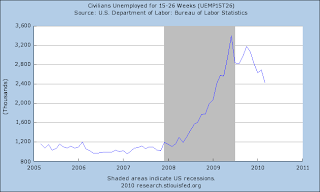 In addition, this number is the denominator in the unemployment calculation. Last month we also saw an increase of 134,000 in overall unemployment. That means the unemployment rate remained stable at 9.7%. In addition, according to the household survey, the number of people employed increased by 264,000. This led to an increase in the employment to population ratio of .1%, from 58.5% to 58.6%. Those "not in the labor force" decreased 238,000. Unemployment numbers are presented in a time-based orientation. That means we look to see how long people have been unemployed. 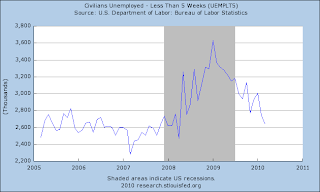 It begins with initial unemployment claims and then moves out to the number of weeks people are unemployed. With the exception of the 27 weeks and longer series, all these numbers are showing improvement. The 4-week moving average of initial unemployment claims continues to move lower. This indicates that the number of people entering the ranks of the unemployed continues to drop. 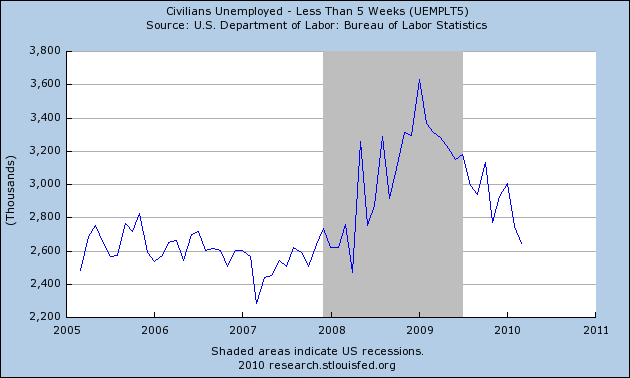 The number of people unemployed for less than 5 weeks continues to drop. In addition, this number is approaching more "normal" levels. 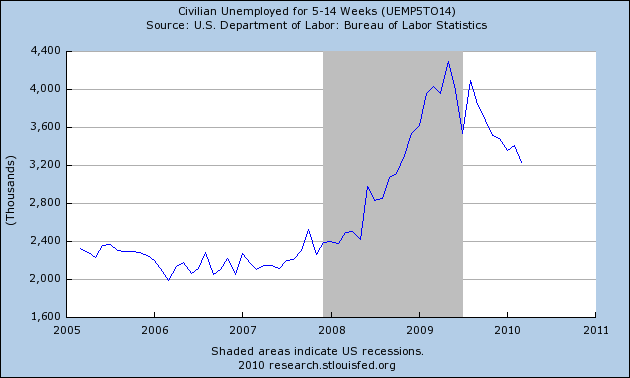 The number of people unemployed for 5-14 weeks is also dropping. However this number is still very high and will require a fair amount of time to get back to a "normal" level. 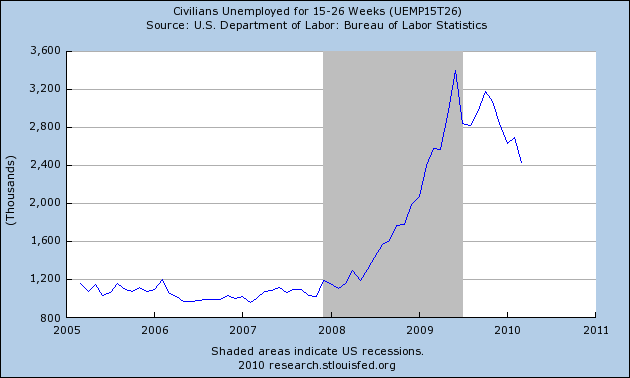 The number of people unemployed for 15-26 weeks is also dropping. However this number is still very high and will require a fair amount of time to get back to a "normal" level. 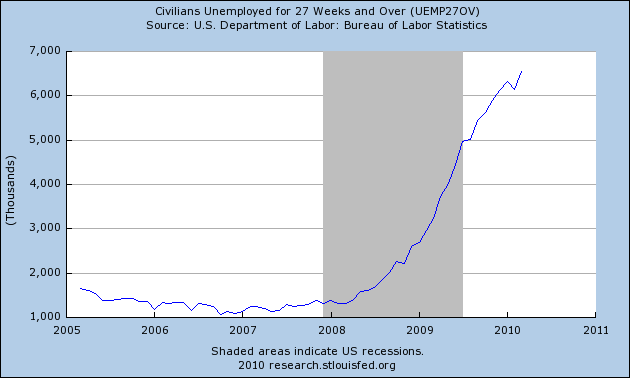 The number of people unemployed for longer than 27 weeks is still increasing. The primary reason for this is a large percentage of job losses during the recession (over 70%) occurred in construction and manufacturing. Construction will never return to the levels seen in the last expansion and manufacturing is undergoing a productivity revolution where employees are being replaced by automation. As such, former construction and manufacturing employees will face an incredibly difficult job environment going forward. Those working part time for economic reasons increased 263,000. I raise these two facts for the following reason. 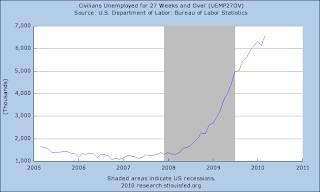 While there is understandable frustration with the current high rate of unemployment, it's important to remember the severity of the damage caused by the recession to the overall employment situation. To use a medical metaphor, a person who had quadrupole bypass on Monday will not be running a marathon on Friday. An economy that lost all of the jobs created in the previous expansion will not turn around and start adding 300,000 jobs/month anytime soon. The establishment survey was solid. First, total private hiring was 123,000 -- meaning the "census workers tilted the numbers" argument is wrong. Secondly, goods producing jobs increased 41,000. This sector of the economy has been a drag on growth for the last few months. In addition, construction and manufacturing jobs account for the vast majority (over 70%) of all job losses during the recession. So an increase in this area of the jobs market is welcome. The change in total nonfarm payroll employment for January was revised from -26,000 to +14,000, and the change for February was revised from -36,000 to-14,000. In addition, service jobs saw an increase of 82,000, with only two service sector areas (financial services and information technology) showing decreases. While average hourly earnings decreased (largely because of labor market slack) weekly hours increased by .1 because the index of aggregate weekly hours increased from 91 to 91.4. This means weekly earnings increased from $762.41 to $763.98. Overall, this is a solid report. Some time ago, Prof. Brad DeLong of Berkeley, thinking aloud with graph, drew a line across the 1991 and 2001 recessions and recoveries, making a "note to self" that it appeared that Initial Jobless Claims post those recessions had to decline to 400,000 or less before payroll jobs were added. Thus, mused Prof. DeLong, it must be so as well, post this "Great Recession." This "note to self" was subsequently repeated by Bill McBride at Calculated Risk, from which it has now been picked up and repeated at Prof. James Hamilton's site, Econbrowser. It is well on its way to becoming Holy Writ. The 1991 and 2001 recessions were very mild. Peak initial jobless claims in those recessions were 501,250 and 489,250, respectively. It would be nuts to think that jobs would be added to the economy anywhere near the 500,000 high water mark in jobless claims from those recessions. The 1973-4 and 1981-2 recessions are much better comparisons.... In the case of the recoveries from both of those recessions, payrolls started to grow as the ievel of initial jobless claims crossed 500,000, not 400,000. 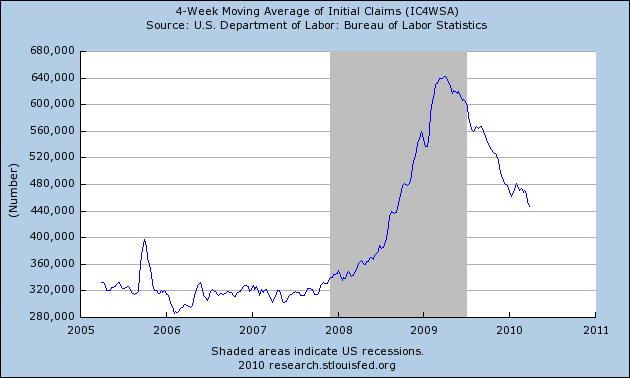 Weekly claims have to drop to about 400,000 to be at a point that is normally consistent with the economy adding jobs. I question whether normally applies. I should point out that Prof. Delong was a good sport, going so far as to repost my rant at his blog, and to drop by here and comment that he hoped I was right. Initial claims dropped below 500k during the week of November 21. The average for the period November through February, at the bottom of employment, was 478k initial claims. Even including March in the average only drops the average to 472k initial claims. 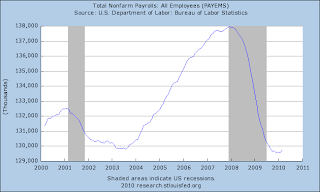 In short, the jobs numbers bottomed when initial claims dropped below 500,000 to about 475,000, not to 400,000 - not exactly as I had predicted, but a lot closer than the rest of the econoblogosphere. You may file this under 'even a blind squirrel finds a nut from time to time' but hey, a little credit here! You're reading the right blog. Let's start with a view I don't often use -- a simple line chart. Notice that prices have broken through resistance at B but have also broken upward sloping trend line A. Prices are currently in an upward sloping pennant pattern. A.) Notice that last week all the bars were weak -- all the bodies were small with fairly long wicks. In addition volume was weak (B). Notice that prices could not keep their upward momentum on any day last week. That tells us traders were extremely concerned about something. C.) We're seeing the A/D line stagnate.